This is my precious tulip bulb coming out of the cold ground and welcoming spring. Just her two little stems make my heart skip a beat. My sweet friend gave me this bulb. On Christmas Eve my friend and her family discovered that their mother has cancer. While she responded with all the normal emotions that comes along with the word cancer, she did something only a gentle and wise soul would: she planted tulips. She knew she would need to be reminded during the cold, dark, and lonely hours that beauty, hope, and life are born. A few months ago we planted the tulips in the dark. We laughed, we cried, we had a beer. After most of the tulips were in the ground, she gifted her fellow gardeners with a bulb. I took mine home and planted it near my front porch. As I covered the little bulb, I prayed for my friend and asked the Creator to remind me of her each time I walked by. Ever so faithfully, He has. 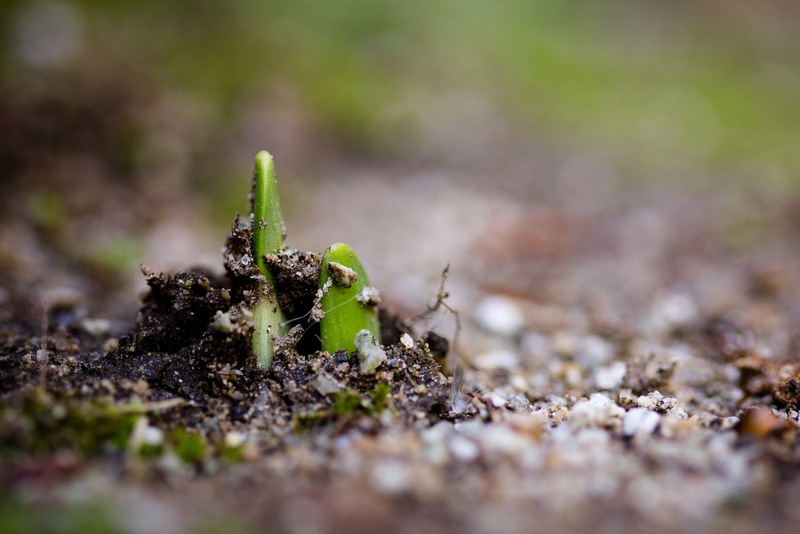 Weeks have past and my little bulb has stayed underground, and each time I pass its spot, I remember the hope that lies in the cold dark ground. Each time I am anxious to see a bit of green, I remember the anxiousness of waiting for hope. Each time I don’t see any change in the ground, I remember the helpless feeling of not being able to change some circumstances in life. Each time I think of my little bulb all alone, I remember my friend who must feel so alone sometimes. Because the dark night of soul is like that, isn’t it? It is a road you must walk alone. While you may have many friends praying for you, lifting you up, and sitting with you on dark days… you alone must walk the road. You must wait in the darkness for hope to spring. Today I walked by my little bulb and saw this. She is just coming out of the darkness. She is reminding me that while today may seem cold and lonely, there is hope in my tomorrows. And with this little taste of hope my hope isn’t only renewed, it also grows. I begin to image what color my little tulip with be. I imagine how tall she will stand. I celebrate that there are two stems, twice has much as I was expecting. I am no longer waiting for a sign of life, but looking forward to all that it will be. I know that I don’t have one friend that is like my little tulip bulb. I know I have many. We all do. We may feel like a little tulip bulb ourselves. So, to my friends that are buried under the harshness of life, may you be given a reprieve. In your anxiousness, may you find be peace. In the unchangeable circumstances, may you find growth and life. In your loneliness, may you find the Comforter. And just like my little tulip bulb, may one little glimpse renew your hope. Such beautiful thoughts, Stacy. Thanks for sharing. They really resonate with me. My dear Mother passed away almost 2 years ago now. It hit me like a ton of bricks and I remember wondering how life could possibly go on without her. I remember standing in church, staring at the lifeless words of the songs on the screen and wondering whether I would ever sing again. It has been quite a roller coaster. Through it all, I've had dear friends and family who have carried me. Also, I've had Beauty – my soul has been fed by the Beauty in this world, some of which has been revealed through my photography. I count it a sweet Grace from God and I'm grateful. My heart has definitely experienced a slow, often painful, but steady reawakening – out of the darkness of raw grief, and into the light of gratitude for the gift of the wonderful woman I was lucky to call my Mother. oh my, what beautiful words. YOu have been such a good steady friend to me and I know to others. Thank you for always praying for light to birth from the darkness. so sorry about your mother….